FREE!!! Shaft Polishing Strip - 1"x12"
These abrasive strips are specially designed for polishing stainless steel propeller shafts. 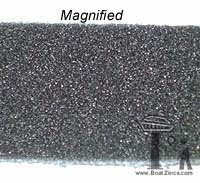 They are 1"x12" cloth-based strips with a metal polishing abrasive that easily remove oxides and scale. The strips are water-resistant and durable, and can be used either wet or dry. They are perfect for divers and other installers that need to quickly and effectively prep a propeller shaft for a new set of zincs.